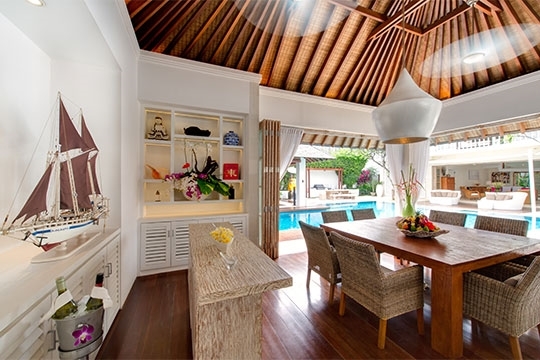 If you are looking to stay in a classy villa in Bali’s most fashionable neighbourhood, Villa Jajaliluna will entice you with its elegance and serenity. 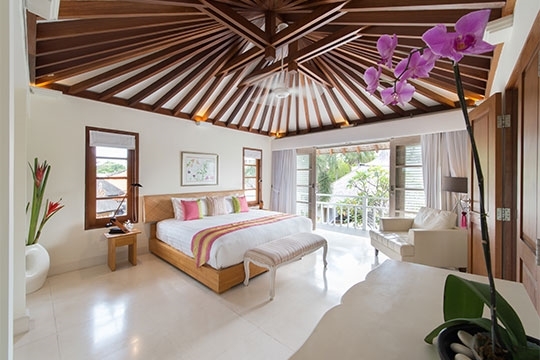 This four-bedroom villa is the epitome of good taste, with cleverly designed architecture that provides guests with the choice of four separate living and dining areas, each presenting the option of breezy, tropical, open-air living or cool, air-conditioned comfort. 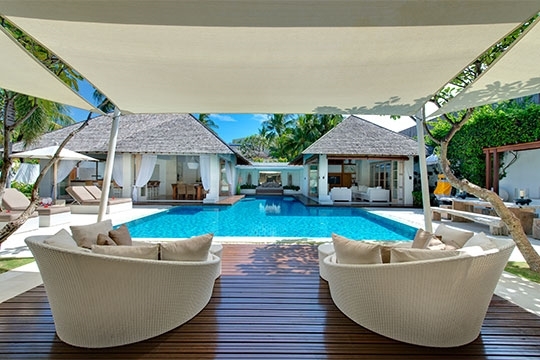 The villa’s restful décor is styled around honey-coloured teak wood, creamy-white Palimanan stone and a blue-tiled pool that eases the senses and convinces you instantly upon arrival that you are entering a place of privilege and taste. Symmetry plays a major part in the design and is evident from the very start. Crossing the threshold over a fish pond, two palm trees flank the main entrance, with twin fire bowls on either side, which bring a whole new dimension to Jajaliluna’s night time experience. A symmetrical two-storey sleeping and living pavilion opens directly onto the pool deck, complete with a barbecue area for alfresco dining, and a sail-shaped Sunbrella canopy, which provides shelter from the elements. Facing this are two separate but identical pavilions housing the TV lounge and the dining room, while a large, T-shaped swimming pool sits between the three buildings and flows with the design to pull the villa together as one. The picture is completed by the ever-present sight and sound of a water cascade at the back of the living room. With three double (queen-size) bedrooms plus a flexible room offering either four bunks (ideal for the kids) or another double if preferred, this villa is well-suited for both families and groups of friends. The elegance of Villa Jajaliluna is complemented by equally elegant service from a team of thoughtful staff including a chef, housekeepers, security and waiting staff who will cater to all your personal needs, whether a simple snack on the pool deck, sunset cocktails and tapas in the upper living room, or a formal dinner in the dining pavilion. Groceries will be purchased at cost price plus 20%++ handling fee. Location, location, location, and a pretty garden full of tropical colour. The T-shaped pool is large with most of its girth running to a family-friendly depth of 1.2m (don’t panic, there is a deep end for the grown-ups) and loads of sunbeds for soaking up the rays. Take care not to walk into the clear glass dividers in the showers; they won’t break but you could end up with a bump on your head! Thank you very much for our wonderful stay. The villa is excellent. The staff is welcoming and polite. We have been taking care of and thank you to Wayan and Putu - our stay delightful and calm. 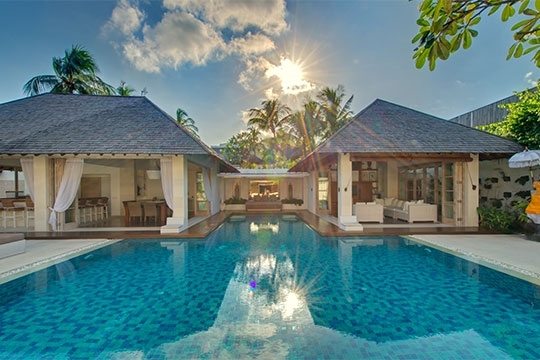 As a frequent traveler to Bali, this is by far the best villa we have stayed at. The staff is amazing with their professionalism and service. They made our Christmas in Bali very memorable. The home is very cozy with all the right amenities. We would love to be back at Jajaliluna sometime soon. The property, facilities and location are all excellent. The service from all of the staff was absolutely outstanding. Such wonderful, friendly, happy and helpful people who could not do enough for us. For those of us who had been to Bali before say that its the best they have experienced here and for us first timers it was wonderful. We will all be recommending Jajaliluna to our friends. Looking forward to coming back. This is our 10th visit to Bali and by far the best yet. Thank you to you all for making us feel at home with your fantastic service. The staff went above and beyond to meet our every needs. We can't wait to come back. Thank you to all of the wonderful staff who made our trip a magical one. We were a group of friends needing a kids free holiday and we couldn't have asked for a better place to stay. The villa is extraordinary and the team worked tirelessly organizing breakfast, massages and delivering drinks. We have had a fabulous time in Bali and we can't wait to come back again. Best wishes to all. Thank you so much. We were only here for a few days but felt that it was so much longer. What a wonderful place to get away and relax. All the staff were beautiful people who could not have been more helpful in making our stay perfect. We hope to be back. We have had such an enjoyable and relaxing time staying here. Thank you so much for looking after us so well. We can't wait to comeback. You are all amazing. Thank you for the efforts to make our holiday memories last a life time. It was better then perfect. We will be back again soon. We are a group of 10, with diverse age group, needs and wants. Fortunately, there's something for everyone to enjoy at the villa. The facilities are top notch and well maintained. What made it a magical stay and holiday for us are the amazing staff. Pak Wayan and his team was attentive, warm and very welcoming. They made it a point to ensure our stay trouble free, relaxing and above all enjoyable. It has been a wonderful week and wished it could be longer and are already looking forward to returning to this magical place again. Once again thank you and god bless all of you. Thank you so much to Wayan, Putu and the whole team at Jajaliluna. Food has been great and your service as well. Chef made some great food for Charlie. The Villa was very nice, clean and in a brilliant location. We look forward to returning some time in the near future. We had such an amazing time thank you all so much. We feel so taken care of and food is delicious. Wayan, Putu and Komang were super kind and helpful. We were spoiled and will return. Thank you Wayan to you and your wonderful team - Putu, Ketut ,Cha Cha ,Komang and security etc. The food and cooking was excellent and the service was attentive and discreet. It's a lovely relaxing villa and the smile on the faces of Putu, Ketut and Cha Cha each morning were a pleasure to wake up to. We all had a lovely time and probably ate too much of your beautiful cooking. Take care and see you soon. What an amazing group of people here at Jajaliluna. They made us feel like family everyday. They were tireless in assisting us with everything we requested and nothing was beyond their kind, gracious assistance. The food, incredible. The home, amazing. The people, outstanding. Thank you to the entire Jajaliluna family, we hope to see you again! Thank you for making our stay at Jajaliluna such a wonderful experience. The Villa is stunning and the staff have been absolutely fantastic. We could not have asked for anything more. We had the most wonderful time in Villa Jajaliluna. We loved your wonderful food Pak Gusti and Chaca, we definitely need a diet the coming weeks. Thanks for keeping the house and rooms clean! Thanks Wayan for bringing us to supermarket, wine shop, art and craft and Tanah Lot! Thank you to Komang and Putu for bringing us all the treats. The kids loved the wonderful and warm pool. We had the chance to see a little bit of Bali and enjoyed the country. Regards to the owner of the villa who made this a place heaven with very charming and atmospheric finishing touches. Thank you so much for the most amazing four days and your hospitality at Villa Jajaliluna. It has been the perfect mother's day gift for the family. Also, thank you for looking after our 2 little monster's Adam and Eden while we explored the city. Hope to see everyone again soon! Thank you for your hospitality during our stay! 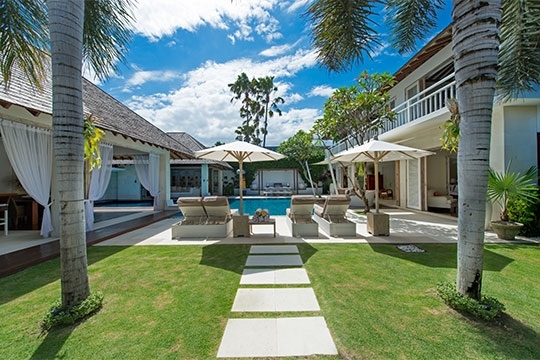 The villa is so well maintained and clean, we are very impressed! We have had an amazing time here and the kids have enjoyed the huge pool and floats. The food has been awesome and we will be leaving with very happy bellies. Take care and god bless! Oh my god, we arrive in heaven here for my 60th birthday celebration with my husband and beautiful three children. Perfect spot to share a precious week together. Wayan and all your wonderful team, a huge thank you for spoiling us. Food, service and care was spectacular. You made us feel so very special. Villa Jajaliluna is certainly a divine villa and we will be passing onto our friends. Hope to see you all again soon. Feeling blessed! Wow, what a wonderful week. Thank you for making us feel so relaxed and spoiled. It is a really hard place to leave, food exquisite. We will recommend to friends and look forward to seeing you back here again, not to far away. Thank you for making our time at Villa Jajaliluna amazing. You have been so helpful with any of our request and so patient with our family, especially our children. Look forward to coming back again! Wonderful 10 days at Jajaliluna. The staff are always smiling, happy and willing. The food has been amazing, we love being here. What a wonderful and happy time the best way to spend a 30th, the food and staff - 10/10, Tommie will always love his first girlfriend 'Putu'. Thank you to the lovely team at Jajaliluna! Our holiday has been amazing and very relaxing with your lovely staff and amazing chef!! Would highly recommend your villa after our experience. Awesome!!! 3rd time back! Never disappoints. Villa immaculate, staff gorgeous, professional, friendly Will there be a 4th visit - of course! Thank you so much Jaja team - you guys have made our girl trip a very special one. You have made us feel loved. The food has been fantastic! The cocktails amazing! You guys are the best! We love you so much we want to bring you all back to Australia. We had an AWESOME time here! Thank you very much for your kind hospitality. The location is great and so quiet, it's truly amazing. We could walk to amazing beaches and places to hang out. The service was the second to none! We hope to come back again next year. Dear Wayan and the wonderful team, thank you for looking after us so well this past week. You have all made us feel very special. Thanks for looking after all of us during our recent stay in Seminyak. We had a wonderful and memorable time and look forward to coming back at some time in the near future. We really appreciated the effort of the team went to help us celebrate Deb, Pete and Tania's 50th Birthday. Thanks for making our stay so relaxing and memorable. Thank you Wayan and the lovely team for a wonderful stay, relaxing environment for me and my family members. 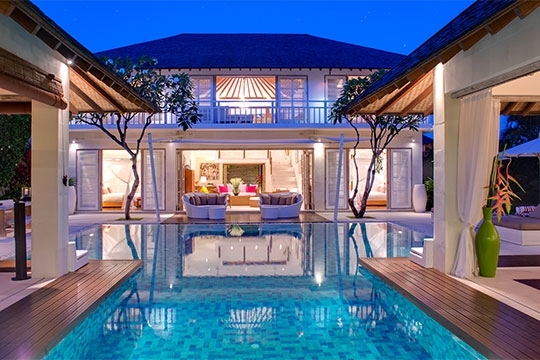 Great villa for a stay in Bali. Love this place - so relaxing. Nice food and great Chef. Enjoy the food very much. Enjoy everything and have wonderful memories. We will miss you. Next time definitely will come again. Thank you for making our stay a pleasant and memorable one. We had lovely time. Thanks for recommending Mozzarella and other places to eat and to see. We wish you all the best and hope to come back again. We have truly had the BEST time, thank you for your amazing faultless hospitality and for looking after us all so well. This was a very special family gathering, joining two families from opposite ends of the world and we couldn't have dreamed of a nicer place for the celebration to take piece. The villa and staff exceeded all of our expectations. And the food was simply divine. Thank you for the trip to Ubud and for your kindness and understanding with the little ones! Thank you so much. Thank Wayan and team together for a relaxing holiday in August and surprising BBQ! We will miss you. Thanks very much for you. Hope you have time come to China. Thank you Wayan and team for a wonderful stay and a relaxing fun filled experience. Love the location and the amazing friendly staff. We could not have asked for a better villa with everything we needed. We will miss you all and see you all again soon. Two years ago we enjoyed a great Holiday in a marvelous environment staffed by friendly and obliging people. We wondered whether the second time around the experience may become not as great, perhaps our expectations may not be met. Well may I emphatically say that this time around all that we experiences matched our first visit. The environment is still superb as are the staff. Providing excellent and anticipating service made more difficult by some of our children who become ill at various times.I have nothing but praise for them and we look forward to reacquainting with them in your villa. Thank you again. Magical stay!! The service was beyond expectations. Gusti BBQ and Banana Pancakes a big thumbs up. The villa staff are polite, friendly and very obliging. A surprise birthday cake for Mr. Anthony was the delightful gesture. A fantastic villa in a great location make it hard to leave. ALAS a cold Geelong winter await our return. 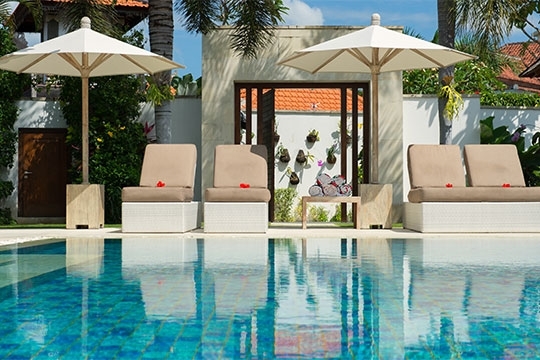 Thank you for a wonderful stay, we plan to be back next year for more wonderful service and Bintang by the pool ! It has been wonderful stay, the rooms, service by the staff and the convenient location has been major - plus points. Would definitely be back soon. Must Visit!! I really enjoy my stay here in Bali! Your service is great! You all are very kind and I would like to come here again. The place is very clea ! I thing you are all very kind as all of you would try your best to give us the best service! The food you cook is very delicious! If I had a chance to come to Bali again, I would DEFINITELY come here! We are so grateful and thank you to all of you for making our time here so amazing. Everyone of you added something special for our trip. Your welcoming smiles, friendliness and kindness made our stay at this villa so beautiful! The food was spectacular and the service was just fabulous! Well done Wayan and all your team, Gusti, Chacha, Putu, Komang, Ketut, Darta, Ngurah, Made, Victor, and Wiratama. Thank you so much! Thank you for an amazing stay. The food was great and the whole team were extremely friendly. Tthe villa is very beautiful. Thank you so much for everything. Awesome villa, so relaxing, awesome staff and fantastic food. 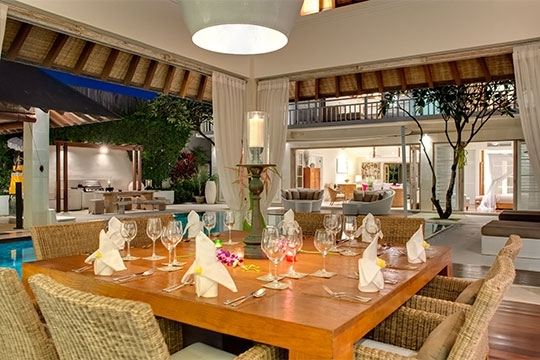 We have been here in Bali more than 200 times and stayed different hotels and villas. We can say that this is so far the best service. Wonderful staff, very friendly and only best things we can describe to this villa and the whole staff. 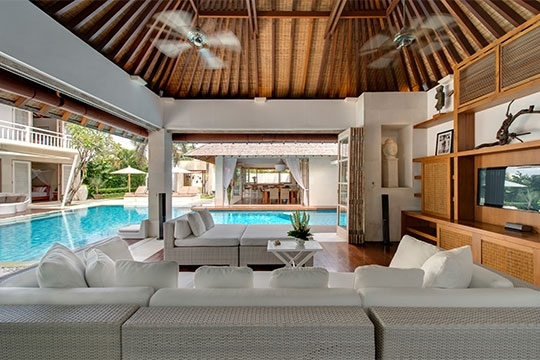 We definitely recommend this villa to our friends. We would like to say thank you from the bottom of our heart for giving us a great vacation and experience. We can never be happy enough to see all the staff smiling all the time and the service minded you all have. A thousand thank yous everyone. Thank you for an amazing stay we have all had at Villa Jajaliluna. A beautiful villa made even better with wonderful staff. We couldn’t have asked for a better villa to stay in for our weeks holiday. The kids first time to Bali made it even better by having a pool to themselves. From the minute we arrived you welcomed the 7 of us like you have known us for years. The meals have been amazing. Thank you for making our first Bali experience the best, thank you for everything. It was a lovely stay at the villa. The property, the location, the team of the villa are absolutely fantastic. The pool is great along with the layout of villa & it is literally walking distance from a lot of the shopping place around. Wayan & co ensured that all our demands were met lovingly & seamlessly. They arrange for us whatever required and desired, from provisions for kids to the place to party, restaurant to eat at etc. A much recommended place for people looking for luxurious and pampered stay whether they want seclusion or an immersive Bali experience. Thank you for fantastic experience and stay. Much appreciated!! We have had a most fabulous stay here. Staff have been superb - going above and beyond to accommodate our requests and helping to try trace a lost phone. Made booking cars, extra activities, food request and absolute breeze. We will all certainly be back and we will recommend to all of our friends. The location and villa sheer perfection. Thank you to Wayan and team for everything. We come here to celebrate my friend Phyllis Birthday. The service by far was the best I have ever seen in all my travels. We will surely be back soon. All the staff were excellent - keep on the giving great service, you guys rock. Thank to putting up with Bali Angels. Supplying us constantly G&T's, our loud music & crazy antics. We had the best time! The Villa is amazing , staff are amazing! Thank you. WE WILL BE BACK. We are stay 3 weeks it was fantastic. Wayan and the staff were very helpful, friendly and attention with the kids. The Villa is superb and we were looked after really well by all the staff. I'd like to thank each and every one of them for their dedication, hard work, and most importantly for always keeping a smile!!! We look forward to coming again to the villa. We stayed at the villa for 3 weeks and had a fantastic time. I have to say thank you very much to Wayan and his team, I have a very good memory of my birthday. Thank you so much to Wayan & the team for all your kindness & helpfulness during our trip to the amazing Villa Jajaliluna. From day one we have been welcomed by your smiles and have enjoyed learning from you since. Thank again for being so kind and accommodating and making our trip a very relaxing one. Look forward to seeing you all again soon. This is our second visit to this wonderful villa and yet again it has been amazing. 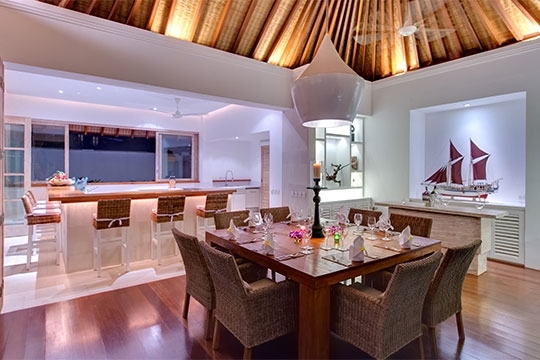 The villa is pristine and comfortable and located in the hub of Seminyak. But of course it is the wonderful staff that make it so hospitable. The worst part is writing this review as it is now time to say goodbye. Love the time with my husband, daughter, and meeting my sister, brother in law, and 3 gorgeous nieces. Should we make a third trip back! !, i don't think I need to ask ....until we meet again. Wayan and staff looked after us amazingly, we had a very relaxing week. Booking in for next year. Enjoyed drinks around the pool and great meals prepared by staff. Can't wait to see you all next year. We love Villa Jajaliluna, the best staff Putu, Komnang, The Manager Wayan, Chef Gusti and others! Thank you to all of you for everything! We had wonderful holiday here, everything was perfect. Thank you very much. WOW what an amazing time we have had, all enjoyed for my 60th birthday celebrations. We love everything about Villa Jajaliluna. The accommodation is fabulous and of course the tranquil setting is amazing. The staff absolutely spoil us. They are a credit of Balinese culture for sure. Our first week here with our two sons and their wives and our two gorgeous grandsons - we all felt very lucky to be staying in such a beautiful villa, I'm sure they would all like to return. Our second week with our very special friends has been fabulous too. We all very sad to be leaving and thank the staff from the bottom of our heart for looking after us so well. We hope to return one day. We would like to wish Wayan and his staff all the very best for the future - you are such beautiful people. A wonderful stay once again, Wayan and the team are always so helpful and generous with their time and recommendation. We love the villa and the location is perfect, we look forward to visiting again soon ! What an amazing stay we have all had at Jajaliluna. A beautiful villa made even better by the most fabulous staff I have met. The food was spectacular. We could not asked for a better villa for our family holiday. Everyone between the age of 5 and 70 were catered for. Thanks so much . we will be back for sure. We love you....thank you! For the amazing food, the amazing staff and the awesome fun we've had! You are so kind to us, we will miss you so much! 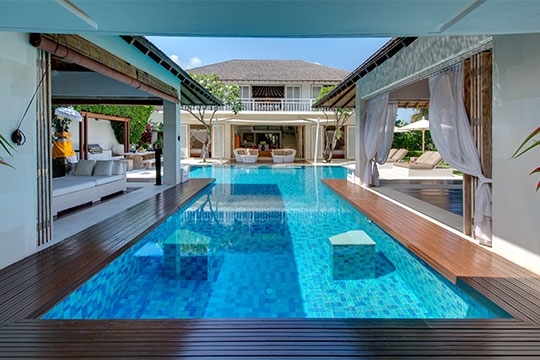 This is the best villa ever! We are definitely coming back to Jajaliluna.....!!!!!!!!!!!! Thank you yet again to the most amazing staff at Jajaliluna in helping us celebrate 2 special occasions. This has been my family's 5th visit and we still cannot get enough of it. Sharing with my brother's family was the most magical fathers day you could wish for. Thank you to Wayan to arranging a visit to a primary school was the highlight of our children's visit. A huge thank you to Komang for putting up with our antics ! and to all the staff who go above and beyond to make this the most amazing experience. We expected a rather delightful place when we entered your villa - it was much better than that. Friends who dropped in always began with.." WOW...! This beautiful villa was fastidiously maintained. All facilities well designed to provide both privacy and social activities. 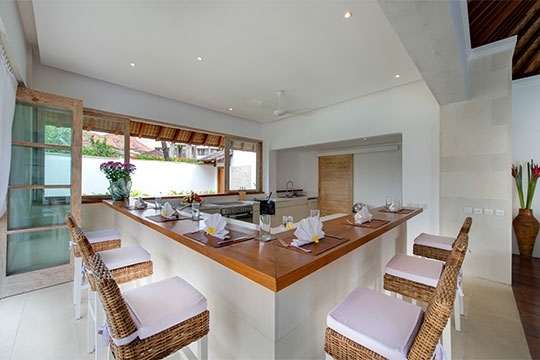 If the villa was wonderful the staff excelled it by their friendliness, their attention to all details and responsiveness to all our needs, and more often anticipating them. The children (ranging from 10 years to 4 years) were particularly well catered for - perhaps even spoiled perhaps (especially by Putu). Thank you so much. Thank you so much for and absolutely amazing 6 days. The villa is incredible and we can not speak more highly of your staff. We were blown away that the staff remembered all of our name and there was always someone available for all of our needs. The food, facilities and staff were all 10 star. Thanks again. Thank you from Indonesia, Denmark, Singapore and United Kingdom, for some lovely days here in the villa. We have enjoyed our stay here and the attentiveness from the staff. Thank you for accommodating all our needs including the purchase of vanilla beans! Thank you very much for looking after us during our stay in Bali. We all had a wonderful holiday and leave with fond memories. Thank you for all the amazing food. And thank you all so very much for the incredible hard work to make Tim's 40th birthday a night he will never forget. It has been a special 10 days. Thank you. To all the amazing staff at Jajaliluna thank you to making our experience so wonderfully relaxing . Your brilliant service and kind manner has made our stay truly brilliant and memorable. We are sad to be leaving but will sure to return. Hugo will miss feeding the fish until next time.Thank you. Thank you to all the wonderful staff at Jajaliluna . You have made as all feel so very happy and comfortable at the villa. Your warm smiles and lovely personalities had made it a wonderful experience for us all be a part of! The villa is amazing in every way and we have been so lucky to stay here as a family. We will miss staying here and seeing you all each day. I know Milla will certainly miss seeing the turtles (now named Speedy and Bubble ). We hope to be back in future and see you all again soon. From very grateful family for all that you here done. Wonderful scenery with delicious food, what you need is just relax. Unforgettable experience spending our holiday at this villa, all staffs are hospitable and professional. Highly recommend!!! Most amazing place and holiday we have had, the staff made it and were so kind, generous with their time and friendship. The Villa was picture perfect, amazingly well maintained and a delight to call home. 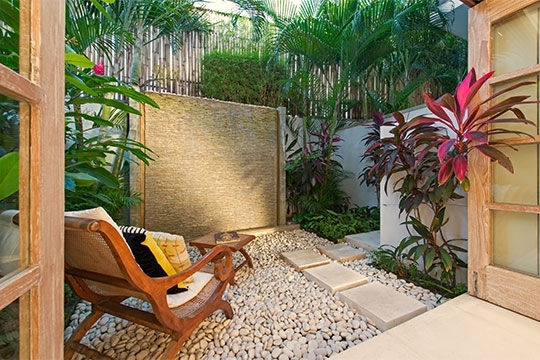 Couldn't have wished for a better place to stay in Seminyak. Everything exceeded my expectations. 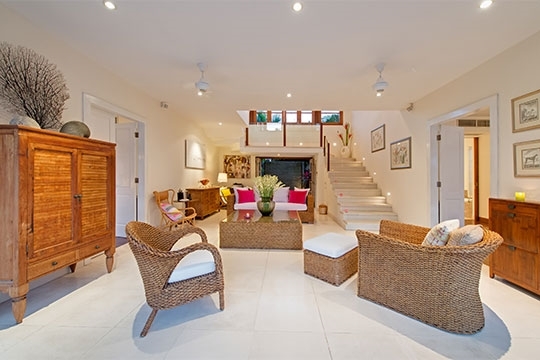 Fabulous location, beautifully designed villa, well maintained, decorated. What made it extra special were the staff. They were there for every need but not intrusive. I really didn't want to leave and will definitely return. Love this villa - did not want to leave! Very clean, well maintained, modern and fresh. The 8 of us thoroughly enjoyed our stay at Villa Jajaliluna. Perfect location, perfect staff. The staff at Jajaliluna are an absolute pleasure, nothing was to much for them and they are perfect at "being there but not being there". Can't wait to go back. Our stay at villa Jajaliluna was an absolute pleasure and one of the best family holidays we have ever had. While the villa itself was stunning and the location perfect, it was the amazing staff that made it a truly memorable experience. Putu, Komang and the whole Jajaliluna team made us feel wonderfully relaxed and at home. Our daughters love and miss the staff and already want us to start planning our next stay, so we will be back! We had an amazing time at the villa. The location is fantastic, close to shopping and restaurants. The villa itself is beautiful and the staff are second to none. The villa is in a perfect location with access to everything we need. The staff are kind,caring, thoughtful and fabulous.. Nothing was a problem. As it was our second visit (and we are planning our third) we felt very comfortable with everything about the villa and cannot fault it. We are very happy to have experienced Villa Jajaliluna now for the second year running. To return to this amazing villa and feel at home was very comforting. This villa is blessed with staff that are like family, only more like you would like your real family to be..... The location is ideal and .....you'll have to stay there to really know the rest! Awesome villa! Great staff and location... Will certainly be back!! Wish I had a villa of my own like this! Everything was as advertised. Villa manager Wayang and the staff were excellent and attentitive. Chef was great and accomadating. We had a wonderful family vacation at Jajaliluna. 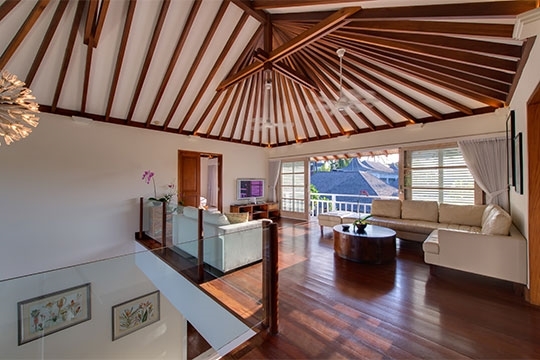 Wonderfully located villa stone throw from beach and main area of seminyak, all walking distance. Excellent staff and lots of outdoor areas in villa so feeling of space and 8 of us were never on top of each other. Great pool too. Could be more grassed area if you had young kids. Great villa with fantastic staff. If you are looking for a quiet relaxing place to chill, this is it. 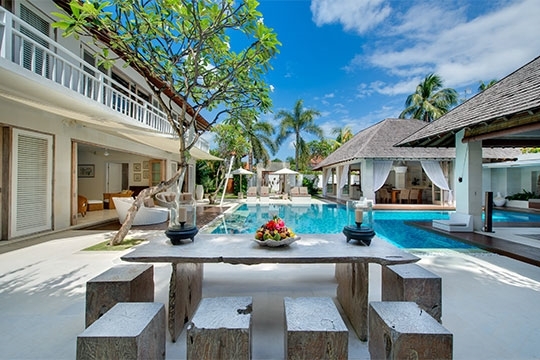 Great for groups looking for a bit of tranquility in paradise and yet near enough to hot spots in Seminyak for the great sunsets. Having spent years trying to find the perfect villa, we have finally found Villa Jajaliluna. Perfect location, spacious and very comfortable, Jajaliluna ticked all our boxes but above all it was the attentive staff that topped off a perfect stay. I recently celebrated my 50th birthday with family and friends for a week at Villa Jajaliluna. It was absolutely perfect! 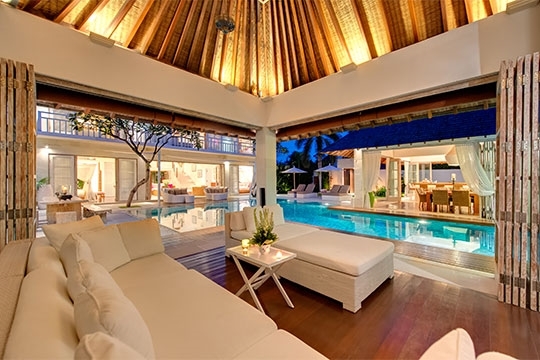 The villa's design around the pool creates the most beautiful area to relax and enjoy outdoor living in the balinese style surrounds. The staff could not have been more attentive and the seafood barbeque we enjoyed for my birthday was a feast not to be missed. I would love to stay there again in the future! Excellant staff, great chef, the food was great. Loved the outdoor and bbq area. The garden shower in the main bathroom was beautiful. Thoroughly enjoyed our stay, staff fantastic, location excellent. The villa was lovely and one of the best I have ever stayed in. For the price, I think they could have offered daily breakfast. 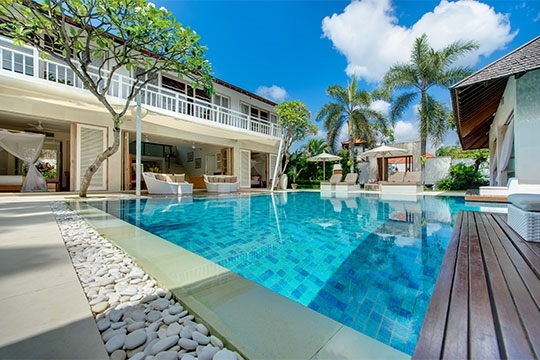 However, this is really a great villa and location is near to many restaurants and bars. Villa Jajaliluna was as good as it looked on the website. The atmosphere was excellent and the poolside BBQ fabulous the night we arrived. The pool area was a great focal point and the design suited our family perfectly. We were with our three adult children and their partners and the layout of the villa gave each couple their own space and areas for different activities. The staff were brilliant and it is situated close to a number of excellent restaurants. Thoroughly enjoyed our holiday. The staff and facilities met our expectations without exception. The villa was in a fantastic position, so close to everything with no road noise. 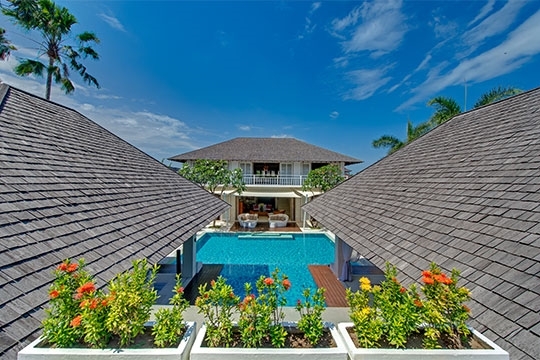 The villa manager Wyan was so knowledgeable with any queries we had on where to eat, shop etc and we felt that he and his staff couldn't be more helpful and caring to ensure we had a great stay. We had fantastic food in house also prepared by chef Gusty who accommodated our grand children's taste with ease. We would recommend Villa Jajaliluna without hesitation. The sleeping and living pavilion is the nexus of Villa Jajaliluna; it houses a ground floor living room, which is furnished with lazy chairs and cushioned sofas, and adorned with antique framed prints (a guest washroom is on one side). From here, a staircase leads up to a timber-floored living space furnished with a large daybed and satellite-channel TV/DVD player. This area is fitted with doors that open completely onto a balcony running the length of the pavilion, which is also accessed from each of the upstairs bedrooms. All four air-conditioned bedrooms (two up and two down) are the same size and shape, and are simple in their design. Three are furnished with king-size beds, while the fourth (upstairs) is appointed with mezzanine style bunks above twin beds, perfect for four children or 2 adults plus 2 children. Each bedroom is fitted with white louvre wardrobes, harmonised by splashes of pinks and greens within the soft furnishings. 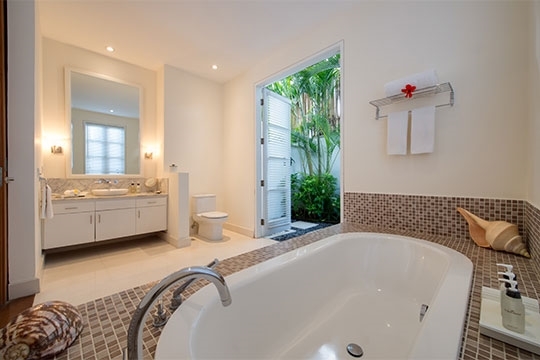 The four ensuite bathrooms present marble-topped vanity units, wall mirrors, ceramic washbowls, and walk-in rainshowers. The two downstairs bathrooms are adjoined by private walled courtyards; one has an indoor bathtub and an outdoor shower, while the other has a bathtub open to the sky.The lounge pavilion and the dining pavilion are square buildings with soaring roofs. The clever design allows guests to completely fold back the doors to create an open-air room, cooled by natural breezes and ceiling fans. Although these single-storey buildings are the same, the mood created by the furnishing styles is very different – The lounge is a cosy snug for reading or watching movies on a large 42-inch flat screen TV, complete with satellite channels, DVD player and surround sound, while the dining pavilion is a little bit more formal, conveniently positioned next to the fully-equipped kitchen, and furnished with a square table for eight.The walled garden has a side lawn and two sun terraces on either side of the pool. 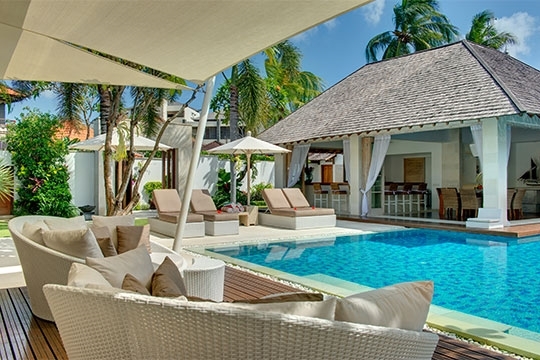 One is furnished with sun-loungers and umbrellas, the other with a picnic table with bench seats. The pool has shallow steps running along its entire width, which makes it suitable for children. 9 out of 10 based on 94 user reviews.